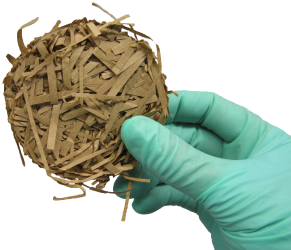 Bed-r’Nest bedding for rodents from Anderson’s Lab Bedding is the perfect bedding material for animal research facilities. The Bed-r’Nest bedding works great for rodents of all kinds including rats, mice, guinea pigs, hamsters and more. Bed-r’Nest bedding allows for a large amount of cost savings because it is re-useable and is able to be transferred during cage changes. This product is irradiated which insures both animal safety and consistency throughout research. Bed-r’Nest is a great nesting material for rodents and has the benefits of being dust-free, which means a clean and healthy environment for the animals. It’s also available in 4g for mice and 8g for rats and come in white for better visibility. If you are interested in Bed-r’Nest and other bedding we carry, then please click here to see our selection of rodent beddings. Here at Lab Supply, we are committed to making sure our customers find exactly what they need. If you have any questions about ordering or pricing of this great product, then please click here to visit our contact us page. We will be more than happy to answer any questions you may have.